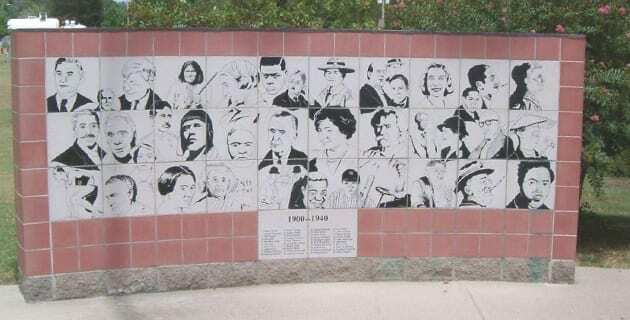 Unveiled on July 4, 2000, The Century Wall is a project spearheaded by Black River Technical College to recognize 100 Americans who helped to shape this country in the 20th Century. The Wall stands in Black River Overlook Park near the heart of downtown Historic Pocahontas on U.S. Highway 67. It is a community project, with local and regional citizens having participated in the suggestion and decisions regarding whose faces should appear on the wall. Black River Technical College hosted a town meeting in the fall of 2001, bringing together the Eddie Mae Herron Board and other interested supporters with representatives of the Historic Preservation Alliance from Little Rock. Following this meeting, the Eddie Mae Herron Board affirmed its desire to secure selection of the building on the National Register of Historic Places, and made all subsequent modifications in accordance with this goal. BRTC prepared and submitted the nomination, which then was approved by the Department of Arkansas Heritage for inclusion for the National Register. Currently, BRTC has partnered with the Eddie Mae Herron Center to bring Black History Month. Visit the Eddie Mae Herron Center online. Serendipity is a program to promote lifelong learning opportunities and to cultivate friendships for the college. The organization is sponsored by BRTC’s Office of Corporate and Community Education and the Office of Development. Serendipity is now in its eighth year, with Patti Blaxton, Dr. Jan Ziegler, and Jessica McFadden coordinating the monthly events. Serendipity is open for interested individuals of all ages. Meetings are typically held Fridays at 11:30, with special events scheduled as available. Meetings typically include music, video, readings and discussions relating to the theme and grounded in selected books. Serendipity also includes occasional short trips to regional places of interest. Serendipity meetings include special holiday events and occasional guest speakers. Even though the books Serendipity will include may deal with a theme that is common to all, the settings of the stories will, as in the past, introduce members to parts of the world or to aspects of the human experience that may not be familiar. For more information on Serendipity, contact Patti Blaxton, at 248-4000, ext. 4181.